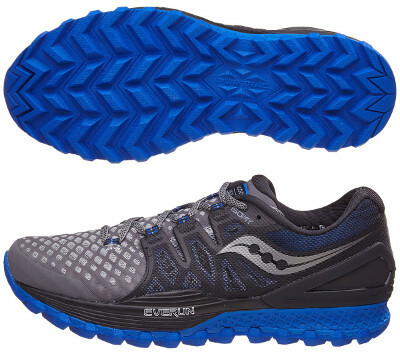 Saucony Xodus ISO 2 are neutral trail running shoes. The Saucony Xodus ISO 2 features latest development of the ISOFIT system which is a bit less chunky and allows more ventilation while still wraps midfoot to provide snug and secure fit. It keeps both EVERUN midsole and awesome PWRTRAC outsole thanks to great performance on any kind of terrain that led to fantastic end user feedback and good sale figures. Major change compared to its predecessor Xodus ISO takes place in updated upper with a lighter ISOFIT system specific for trail running shoes which include eyelets so pressure from lacing system will provide a custom and snug fit. Another change is the reenginered heel counter featuring additional stability for a more secure stride regardless terrain. The Xodus ISO 2 maintains gusseted tongue for extra comfort preventing debris and dust from jumping inside. Rest of Xodus ISO 2 remains untouched with 3 mm full-length EVERUN™ for responsive ride. Nobody misses very well known Vibram® outsole because of impressive PWRTRAC one. It adopts TRI-FLEX configuration (already seen in other Saucony running shoes like popular Ride 10) in forefoot to increase flexibility and traction for smoother transition while lug design in rearfoot are arranged in opposite direction to provide better grip specially in downhills.